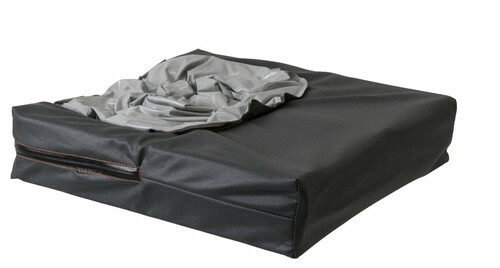 The JAY Fusion® is an adjustable wheelchair cushion designed for skin protection that features JAY Flow® Fluid or ROHO DRY FLOATATION® air insert options in a package that's comfortable, stable and supportive. The width of the Fusion's Pelvic Loading Area was determined by using the average pelvic bone measurements of users of each cushion width. This accommodates the vast majority of individuals, offering forward and lateral stability that is easy to modify for proper positioning, and optimal immersion and weight distribution to protect the skin from breakdown. The Fusion wheelchair cushion may be ordered with JAY Flow fluid or ROHO DRY FLOATATION air inserts, which conform to each individual's shape, adjust to sitting positions, and ensure proper fluid placement beneath bony prominences to help protect the skin from breakdown. The fluid pad's zero-maintenance design delivers superior results for the life of the cushion. 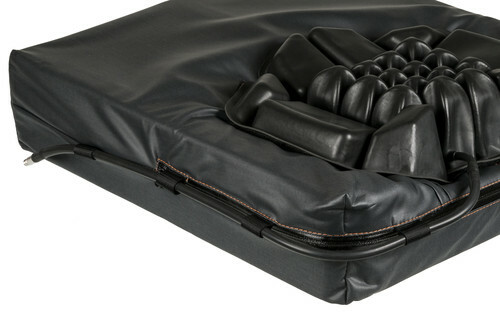 The ROHO DRY FLOATATION's air levels may be adjusted in the field to accommodate asymmetrical postures and changing needs. For convenience and protection, the JAY Fusion features a dual-cover system. The water-resistant inner cover is easy to clean and includes anti wicking seam thread and Aqua-guard zipper for foam protection. The machine-washable, stretch outer cover utilizes naturally anti-microbial, silver-impregnated X-static® fiber. A layer of 3DX spacer fabric promotes airflow for additional skin protection. The Fusion's outer cover now includes a handle for easy removal, zipper cover flap for a clean look, waterfall seams for enhanced comfort, and a QR scan code on the label for quick access to this web page. The Fusion features a pre-contoured closed cell base that provides lateral and forward stability that is easy to modify. The pre-contoured high resiliency foam layer base with posterior pelvic wall provides positioning of the pelvis and thighs & reduces fluid migration. Additional positioning is provided by the soft, contoured top layer. Its femoral transition and rear wall help prevent fluid migration while gently supporting the trochanters and posterior pelvis.